A Motorcycle Sissy Bar Bag For Your Bike? 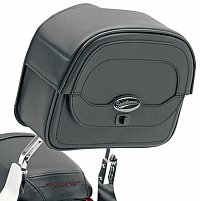 A motorcycle sissy bar bag could be your best choice of motorcycle luggage for your particular motorcycle. They come in a many practical sizes and combinations. Some smaller bags are intended for you to use alone and others are part of multi-bag sissy bar luggage systems. Need a bag for your sissy bar? No matter which style bag of this type you're considering, you must attach it to an appropriately-sized sissy bar or backrest. Does your motorcycle have one? If not, you'll need one. If you're considering a large bag, it's best to support it on a luggage rack while also attaching it to your bike's sissy bar. 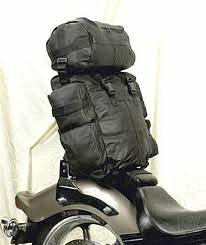 However, if you don't plan on carrying a passenger, you could rest a heavy bag on the back of your motorcycle's seat. Smaller bags fit most sissy bars or backrests without an issue. Attaching them is easy. You'd attach a larger motorcycle sissy bar bag with either the its built-in bar pocket or strap/tie-on system. Both mounting systems often include adjustable Velcro straps and quick release buckles. The pocket system lets you slide a pocket in the bag over your bike's sissy bar or backrest. With a strap system, you'd slide the bar or backrest under straps in the bag then tighten them down. The main message here is to make sure a larger bag or luggage system will fit okay onto your bike's sissy bar or backrest before you bring it home. How you plan to use your motorcycle sissy bar bag? Will you need it only for touring? Will keep it on your motorcycle all the time? Do you plan to carry lots of gear or just the essentials? Do you need extra space for a passenger's gear? Use this info to help you determine the size and style bag that will work best for you and the bike you ride. When considering any kind of motorcycle luggage -- including a bag for the sissy bar -- your best bet is to look first at your own bike manufacturer's products. Hard luggage is standard gear on serious touring motorcycles. And you can get luggage as an accessory for many other bikes. If your bike manufacturer provides motorcycle sissy bar bag that meets your needs and fits your budget, you can be sure it will also fit your bike and blend well with its design. Most of bags of this type are made of hefty nylon, and many are made of synthetic leather. Both materials are tough, but nylon wins out on giving you good wear. However, leather looks best on cruiser style motorcycles. Most bags are water resistant but not waterproof. So look for a bag equipped with a rain cover that will keep your gear dry in wet weather. 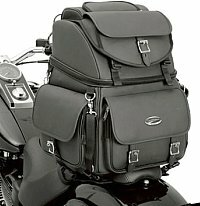 Your motorcycle sissy bar bag capacity options increase to the point where you can get a single bag or multi-bag system large enough to carry all your gear for an extended trip. 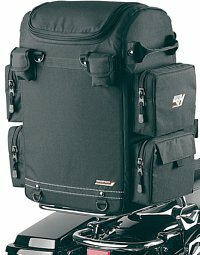 What size bag best suites you and your motorcycle? When determining what bag will work best, first determine how much gear you expect to carry so you can look for a bag that suits your needs as well as your motorcycle's gear-carrying capabilities. When fully loaded, a sissy bar bag that's too heavy or rides too high can make your motorcycle unwieldy or difficult to steer. Also, the extra weight of a too-heavy bag may eventually break the sissy bar, luggage rack or even part of your bike's frame. Try to fit test your bag of choice on your own motorcycle before you buy it. Or work with a dealer that has a friendly return policy. And after you snap on your new motorcycle sissy bar bag, step back and admire your good choice. Looking for a bag for your sissy bar?